Cp,gas: Ideal gas heat capacity (J/mol×K). ΔfG°: Standard Gibbs free energy of formation (kJ/mol). ΔfH°gas: Enthalpy of formation at standard conditions (kJ/mol). ΔfusH°: Enthalpy of fusion at standard conditions (kJ/mol). ΔvapH°: Enthalpy of vaporization at standard conditions (kJ/mol). Tboil: Normal Boiling Point Temperature (K). Tfus: Normal melting (fusion) point (K). 1: Molecular weight from the IUPAC atomic weights tables. 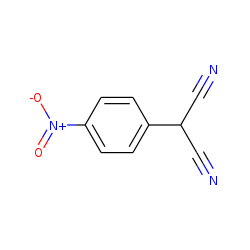 Find more compounds similar to C9H5N3O2. Note: Cheméo is only indexing the data, follow the source links to retrieve the latest data. The source is also providing more information like the publication year, authors and more. Take the time to validate and double check the source of the data.